A dental implant is a small post that’s made from high-grade titanium. A biocompatible material, it fuses with the underlying jawbone after being surgically placed. The result is a solid foundation for your teeth and entire facial structure that rivals that of your natural roots. One of the goals of your dentist in Eugene is to always place the needs of the patient at the forefront. Thus, before a decision is made to go with the dental implant procedure, you first visit for a consultation. While there, a series of X-Rays images will be taken to determine whether you have enough healthy bone to support the procedure. It is a combination of the tedious nature used to evaluate the patient’s pre-surgery condition and expert knowledge that provide a for a successful procedure. Following the placement of your implant, you’ll be allowed time for your jaw and soft tissue to heal. After the initial healing is completed, an abutment will be added that acts as an anchor for the permanent fixture (crown, bridge or implant-retained dentures) to be affixed to the implant. You’ll then be fully restored. 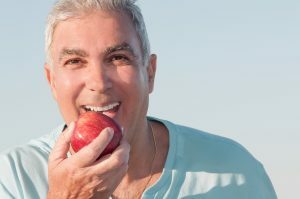 Practice Excellent Oral Hygiene – There’s a good chance that you’re the right candidate for a dental implant if you’re willing to brush and floss your teeth at least two times a day. That will foster a healthy environment in your mouth that helps to protect your dental implant. Maintain Regular Dental Visits – Equally important as practicing excellent oral hygiene is maintaining semi-annual visits to your local dentist. Not only will they provide you with thorough cleanings but will also allow the professional to monitor the condition of your dental implant. Acting on what you’ve learned above will increase the longevity of your dental implant and ensure that you continue enjoying life. To learn more about the dental implant process, feel free to reach out to your dentist to schedule a consultation. You’ll soon be on the road to a beautiful and healthy smile. Dr. Ben A. Sutter earned both a BA in Psychology and a BA in Biology from the University of Nevada at Las Vegas. He then went on to receive his D.M.D. degree from the University of Medicine and Dentistry of New Jersey. In his postgraduate capacity, his commitment to excellence hasn’t wavered, as he’s also attended the prestigious Las Vegas Institute for Advanced Dental Studies. Dr. Sutter helps patients regain the lives they once had with dental implants at For Beautiful Smiles. He can be reached for more information through his website.